When was the last time you had your chimney inspected? • Have your chimney inspected. • If we find you need repairs or a new chimney liner Aces Home Services technician will help you decide on the most economical solution to meet your needs. • Think of your chimney liner as an investment in your property because it is. • Most common chimney liners easily will last at least fifty years in regular use. Chimney liners make fireplaces safer and far more durable. At the beginning of each winter season, take time to inspect your fireplace and your chimney. • Make it a point to repair any portion of your fireplace or chimney if necessary to ensure safety of you and your family members. • Moreover, if your chimney is more than a few years old, Aces Home Services urges you to consider adding a chimney liner. • A chimney liner assures your chimney’s structural integrity, dramatically reduces fire hazards, and stretches the interval between routine inspections, cleaning, and maintenance. Especially if you own an older home, you cannot afford to take your chimney for granted. • Over time, the by-products of your wood fires accumulate on your chimney walls. • Tar and creosote can and do build-up on the inside of your chimney; this clogs and reduces your chimney’s “draw”, and increases your risk of fire. • Chimney defects also contribute to deadly combustion gases—including undetectable carbon monoxide and known carcinogens—to vent into your living room, dining room, or bedrooms. • Just as importantly, your chimney itself may deteriorate over time. • The mortar cracks and chips, often leaving gaps where sparks can escape posing a fire hazard. • A fire can start either on your roof or under your eaves from a single spark. The bricks also may have chipped, cracked, or broken because of constant expansion and contraction and require mortar repair. • Holes and gaps reduce the chimney’s efficiency, so that your fires produce more smoke, and your fuel does not burn as hot or as completely as it should. If you live in an earthquake-prone or high wind area, you should consider the advantages of adding a chimney liner to protect against damage from Nature’s fury. Do you really need a chimney liner? Developers of tract homes either skimp on chimney liners or omit them altogether, which saves money without compromising aesthetics or curb appeal. Safety should never be compromised at any price. 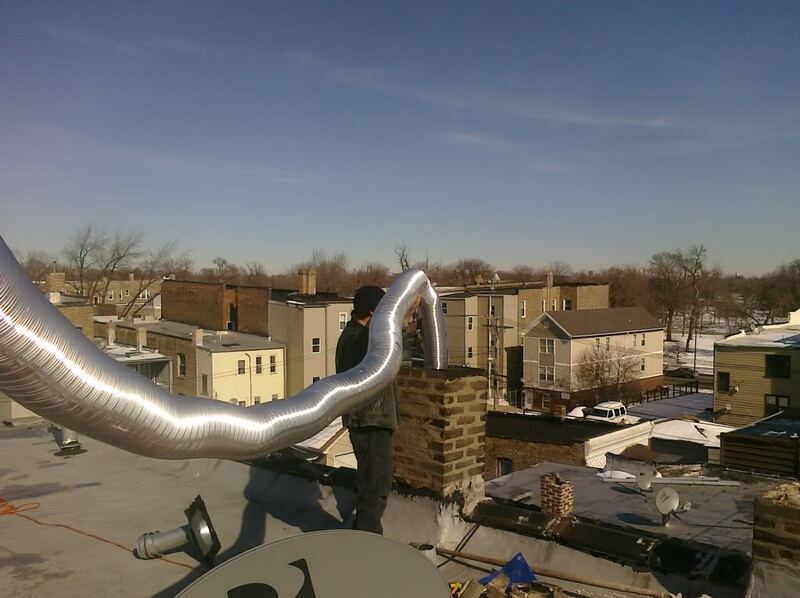 If you do not have an original chimney liner, or if your builder-installed liner shows serious signs of age, damage, and defect, you have at least three options for installing a new one. First, you may renovate a clay tile flue with new tiles and fresh mortar or grout—usually the most efficient and economical technique, except that it requires taking the bricks apart and then rebuilding the chimney. Translation: make sure you hire an experienced artisan. Second, as an alternative to clay tiles, you may use poured-in place concrete mixed super smooth so that it is capable of withstanding maximum heat. An extra smooth surface reduces the need for chimney cleaning, because soot and creosote typically stick in the pores of older liners. Not all concrete contractors know the techniques for forming and pouring chimney liners, so make certain you hire Aces Home Services. Alternatively, you may choose a metal alloy flue and liner that combines corrosion resistance and excellent heat conduction with ease of installation. Aces Home Services technicians have the prerequisite knowledge and experience to discuss with you the best options for your home and budget. Be confident in knowing with Aces Home Services you are working with an experienced fireplace specialist who can suggest the correct option for you.